What is Marlan® Solid Surface? We are manufacturer of Marlan® Solid Surface, a high-quality synthetic material comparable to solid surface materials like Corian® from Dupont and HiMacs from LG. A unique feature of Marlan® is that this solid surface is based on polyester resin. The use of this high-quality resin provides Marlan® with its beautiful pure color and its distinctive touch: a stone-like surface that never feels cold. The choice for a polyester resin is our main difference with other solid surface suppliers. In addition, Marlan® can be processed like wood, with use of the same machines and operations. Marlan’s® surface is sanded, which has the advantage that it can be maintained. Marlan® is a durable material that is hard to damage. In case any scratches or other damages do occur, these can be repaired. This provides Marlan® with a high-quality character. For technical details and our product data sheet, see a number of downloadable files on the right. Who is Marlan B.V., manufacturer of Marlan® Solid Surface? 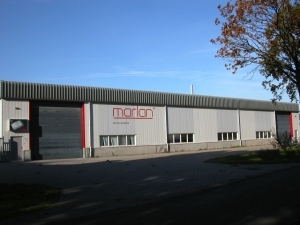 Marlan B.V. is a Dutch family business, with a mission and vision that fit a family business. We stand for a future, not just for the company, but also for our employees. This value is part of every aspect of our business. We do not work for each other, but with each other. We value a good cooperation with our partners and customers as well, and like to work based on openness and transparency. This way, we believe we can realize unique projects, and together deliver a final product that exceeds expectations. Our mission is to produce a beautiful material. It goes without saying that this also involves the necessary support to process the material into a final product. We are a flexible company that contributes ideas and even helps you if needed. We do this for instance by supporting the installation of large projects. Our mission therefore does not stop with producing the material, it only starts there. We are convinced that with our 30 years of experience, we can provide the right support and knowledge needed to design and process Marlan® Solid Surface into a beautiful final product. Besides, our Marlan team is innovative and works with just the right amount of stubbornness to realize a unique Solid Surface. Our vision is that everyone will know Marlan as the company that is partner in the design, production and processing of a beautiful Marlan® Solid Surface final product. Please send us an email, ask us for samples or call us if you have any questions. Quisque sodales, turpis quis interdum placerat, nunc erat blandit leo, sed viverra ipsum elit a enim. Class aptent taciti sociosqu ad litora torquent per conubia nostra, per inceptos himenaeos.